You are here: HomenextCity InsightsnextCan you help Friends of the Field? Friends of the Field are researching the social history of the green space known today as ‘BHASVIC Field’. Located between Old Shoreham Road to the south, Dyke Road Park to the north, BHASVIC to the east and the railway line and Cardinal Newman Catholic School to the west. This space is now used by four local schools for sports and games as well as by the local community. 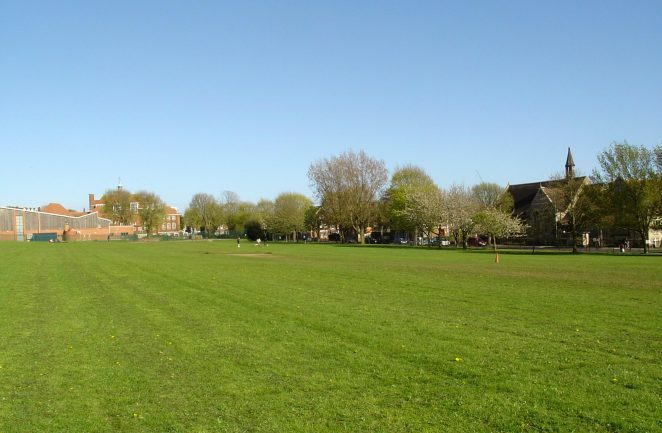 If you attended Brighton Hove and Sussex Grammar School, you will certainly recall being on your playing field during organised school-related activities such as team sports and CCF. Do you remember it being used for any other interesting activities, either formal or informal, by the school or by others? Click on the images to open a larger version in a new window. Perhaps you lived, worked or were educated in the Seven Dials area and remember the field. Did you ‘dig for victory’ there? We understand that a few allotments remained at the western end until the mid-1950s. Even if you only passed by or through en route to somewhere else, you may still be able to recall others on the field. Do your parents or grandparents have any memories – of their own or gleaned, perhaps, from their parents? The residential roads running south from Old Shoreham Road opposite the field were built up during the early years of the 20th century. At this time, too, there was a nursery in the south-western corner of the field, abutting the railway line. 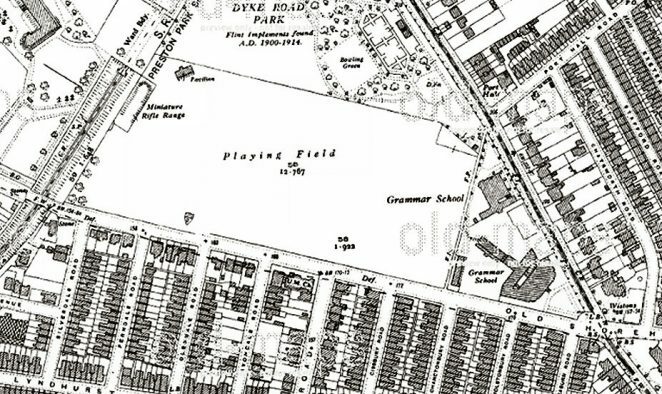 The Grammar School did not purchase the land, for its own recreational use, until 1914. More recently, do you recall when the field first started to be used regularly by the local community for leisure activities, including dog walking? When and how did this happen? Recent and not so recent memories – all are welcome. So too are photos, perhaps currently languishing in attics. We’d appreciate as many pieces of the jigsaw as possible: however miniscule they may seem, they all contribute towards the bigger picture. Ninka, one of the largest ‘strings’ on this website is the Brighton & Hove Grammar memories [mine included!] much about use of ‘The Field’ in those. Listed as BHASVIC I think. Editor’s note: That section is linked in the piece above Geoffrey – but – in line with our terms and conditions here – no content can used without the permission of the author. So if Ninka wishes to use any of the content in that section, the writer of the piece has to give their permission. They can of course be contacted to obtain that. Thanks, Geoff – am hoping to braid this string into a rope of reminiscences. . .